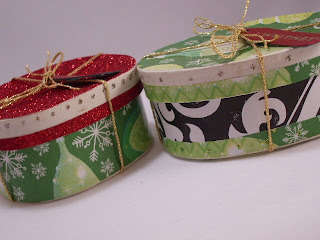 Whisker Graphics: Handmade Goodies for Me! My little elf self has been working hard on making some handmade stuff for this holiday season, but little did I know there was another elf in my midst who was also working quite hard. My pal, Cierra, at work bestowed these beauties on the LOML and myself yesterday. Well, knock me over with a feather! I mean, just look at the details! 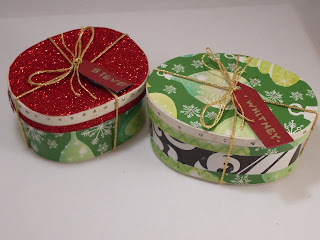 She did some shopping at Paper Source and spied these plain boxes and then just let her creativity go. Inside were a couple of homemade truffles. Sweet! She didn't stop there. She also made us a beautiful card that becomes an ornament. Truly, my poor photography skills do not do it justice. It's dated and she wrote a lovely sentiment on the back. 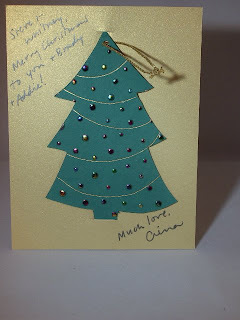 The tree pops out of the card, ready to hang. I so appreciate the care and creativity that went into these goodies and I will have good memories each year we hang the ornament on the tree!